Event marquee is a great way to branding and promote your business. Especially for outdoor event. With the collapsible frame, you can set up the marquee in few minutes. Our canopy is full colour print on four sides. You can also choose to have extra full wall and half wall to maximum your advertising. Once you had the frame, you can just order print canopy and walls in the future. Q: How long will the event marquee take to produce? A: Our production lead time for event marquee is 7 working days from order confirmed and payment made for quantities of 5 or less. Q: What material is the printed canopy and walls? 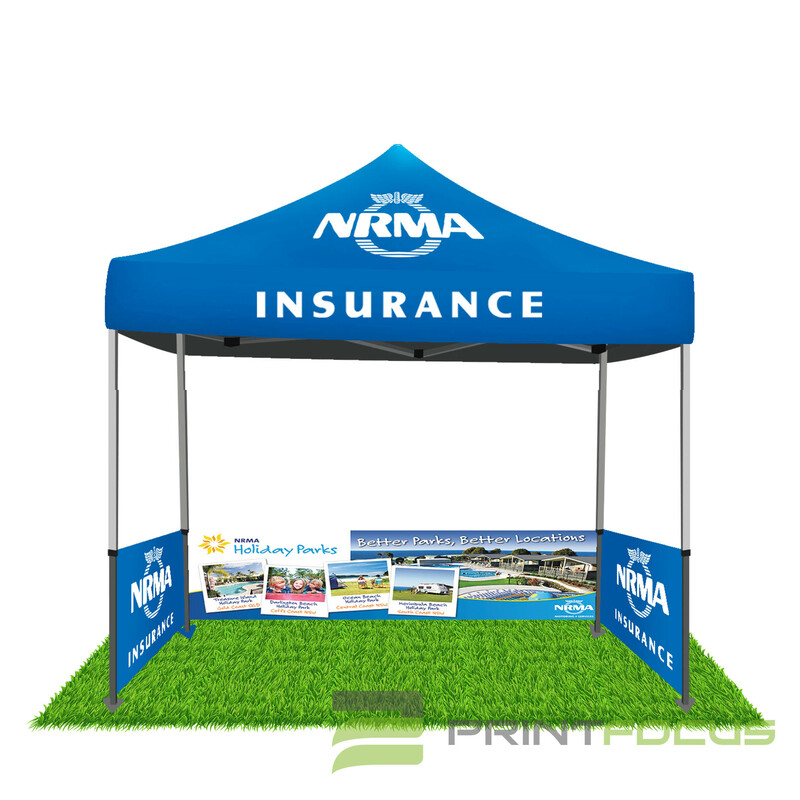 A: The canopy and walls are made from a high quality 500D Oxford polyester material and includes high resolution full colour printing. The material can be printed with any colour and design you create. Q: How long does it take to assemble the event marquee? A: It only takes 2 people about 5 minutes to set up the event marquee. Q: How do I secure the event marquee? A: The steel base plates on the base of each leg has 2 holes where you can insert pegs to secure the event marquee. We also supply sandbags which can be filled with 10 kgs of sand and attached to the posts of the event marquee. However we strongly recommend that you obtain professional advice on what is required to secure your event marquee in your specific location. Event marquee should not be used during strong winds. Q: How can I remove any creases from the polyester fabric? A: We recommend that you use a steamer to remove any creases from the polyester fabric. Q: Which side of event marquee wall will be printed? A: The printed walls have velcro sewn along the top on one side - to allow it to attach to velcro sewn onto the inside of the marquee canopy skirt. This means that a single sided print is not reversible so it is important to select whether you want the print facing the inside or outside.Which must be selected and indicated in order details. Q: How do I attach the back wall to the event marquee? A: The back wall comes with a velcro strip across the top and with velcro loops down each side. The velcro strip at the top is attached to the velcro on the valance (the skirt of the roof) and the velcro loops are attached around the vertical poles of the frame.